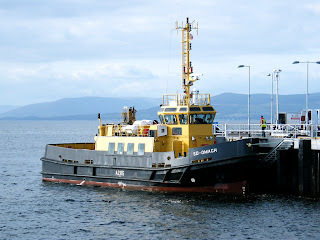 Serco Denholm's SD Omagh is, I believe, the first vessel (outwith Calmac, Waverley, and vessels involved in construction?) to berth at the "New" Largs Pier 17 September 2009. If this berthing is anything to go by, the rubber fenders at the berths will be well used!